Wolves scored two last-gasp goals to beat Rotherham in an incredible game and close in on the League One title. Wolves looked to be coasting as Nouha Dicko's close-range double and a Dave Edwards strike saw them respond to Kieran Agard's early headed opener. Agard's second and Dicko's hat-trick goal made it 4-2 after half-time, but the Millers levelled late on through Joe Skarz and Agard's third. But a dramatic finale saw Sam Ricketts and Kevin McDonald shots earn victory. Brentford's win over Preston North End means Wolves still need four points to be certain of the championship, but because of their vastly superior goal difference one more victory will realistically be enough. 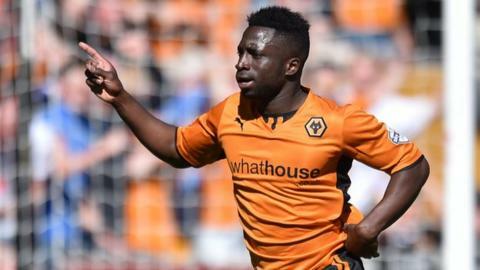 Nouha Dicko has scored five times in the two meetings between Wolves and Rotherham this season, after netting twice for the Millers in a 3-3 draw in the reverse fixture in December. His hat-trick was the first by a Wolves player since Sylvan Ebanks-Blake's treble in a 3-3 Molineux draw against Norwich City in February 2009. The hosts fell behind when Agard's header from Michael O'Connor's corner drifted past goalkeeper Carl Ikeme. But the Millers, who were already assured of their play-off place, were second best thereafter and could not cope with the attacking quality from Kenny Jackett's side. Dicko, who scored six goals in six games for Rotherham when on loan from Wigan earlier this season, stabbed home a cross from Bakary Sako to level and fired in a second from 10 yards. It was 3-1 when Scott Golbourne found Edwards, whose well-placed shot was his third goal in as many games. Agard's shot on the turn gave the visitors hope but that hope seemed to be quickly over as Dicko converted an Edwards cross for his treble. Rotherham came again and looked to have earned an unlikely point when James Tavernier's 84th-minute cross was volleyed in by Skarz and Agard completed his hat-trick four minutes later. But Wolves skipper Ricketts blasted home from 20 yards for the ninth goal of a remarkable afternoon's entertainment at Molineux. And McDonald completed the scoring from close range in time added on. Match ends, Wolverhampton Wanderers 6, Rotherham United 4. Second Half ends, Wolverhampton Wanderers 6, Rotherham United 4. Goal! Wolverhampton Wanderers 6, Rotherham United 4. Kevin McDonald (Wolverhampton Wanderers) right footed shot from the centre of the box to the top right corner. Assisted by Nouha Dicko. Attempt missed. Michael Jacobs (Wolverhampton Wanderers) left footed shot from the left side of the box is close, but misses to the left. Corner, Rotherham United. Conceded by Danny Batth. Substitution, Wolverhampton Wanderers. Matt Doherty replaces David Edwards. Goal! Wolverhampton Wanderers 5, Rotherham United 4. Sam Ricketts (Wolverhampton Wanderers) left footed shot from the centre of the box to the top left corner. Assisted by David Edwards. Kieran Agard (Rotherham United) is shown the yellow card. Goal! Wolverhampton Wanderers 4, Rotherham United 4. Kieran Agard (Rotherham United) right footed shot from the centre of the box to the bottom right corner. Assisted by James Tavernier. Goal! Wolverhampton Wanderers 4, Rotherham United 3. Joe Skarz (Rotherham United) right footed shot from the centre of the box to the bottom right corner. Assisted by Nicky Adams. Joe Skarz (Rotherham United) is shown the yellow card. Foul by Joe Skarz (Rotherham United). Nouha Dicko (Wolverhampton Wanderers) wins a free kick in the defensive half. David Edwards (Wolverhampton Wanderers) wins a free kick in the defensive half. Attempt blocked. Wes Thomas (Rotherham United) right footed shot from outside the box is blocked. Nouha Dicko (Wolverhampton Wanderers) is shown the yellow card. Goal! Wolverhampton Wanderers 4, Rotherham United 2. Nouha Dicko (Wolverhampton Wanderers) right footed shot from the right side of the six yard box to the bottom right corner. Assisted by David Edwards. Attempt blocked. Kieran Agard (Rotherham United) right footed shot from the centre of the box is blocked. Substitution, Rotherham United. Tom Hitchcock replaces Michael O'Connor. Attempt saved. Wes Thomas (Rotherham United) right footed shot from the left side of the box is saved in the bottom left corner. Sam Ricketts (Wolverhampton Wanderers) hits the right post with a right footed shot from the right side of the box. James Tavernier (Rotherham United) is shown the yellow card. Foul by James Tavernier (Rotherham United). Michael Jacobs (Wolverhampton Wanderers) wins a free kick in the defensive half. Attempt blocked. Ben Pringle (Rotherham United) right footed shot from outside the box is blocked. Substitution, Wolverhampton Wanderers. Jack Price replaces Bakary Sako. Substitution, Rotherham United. Ben Pringle replaces Haris Vuckic. Attempt missed. Kevin McDonald (Wolverhampton Wanderers) right footed shot from outside the box misses to the left. Corner, Wolverhampton Wanderers. Conceded by Adam Collin. Attempt saved. Nouha Dicko (Wolverhampton Wanderers) right footed shot from the centre of the box is saved in the top centre of the goal. Attempt saved. Craig Morgan (Rotherham United) header from the centre of the box is saved in the top centre of the goal. Corner, Rotherham United. Conceded by Richard Stearman. Substitution, Rotherham United. Wes Thomas replaces Alex Revell. Foul by Nicky Adams (Rotherham United). Danny Batth (Wolverhampton Wanderers) wins a free kick in the attacking half. Attempt missed. Nouha Dicko (Wolverhampton Wanderers) right footed shot from the centre of the box misses to the left. Goal! Wolverhampton Wanderers 3, Rotherham United 2. Kieran Agard (Rotherham United) right footed shot from the centre of the box to the bottom left corner. Assisted by Michael O'Connor with a cross.